During a recent on-line chat, I mentioned one of my quick breakfast solutions, gluten-free, for busy mornings: Make ahead smoothies. The greatness here isn’t so much in the ingredients, but rather in freezing individual portions en masse, and using as needed. Busy morning ahead? 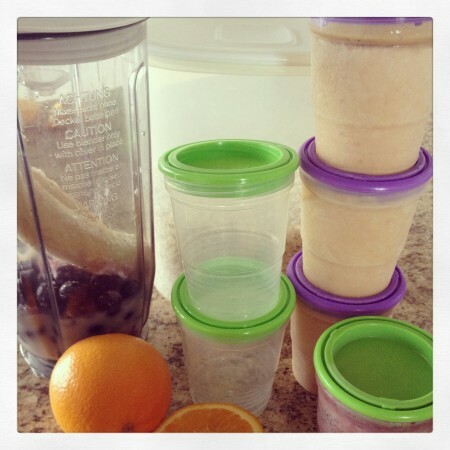 Place the frozen smoothies in the fridge the night before and come morning, it’s ready to enjoy. Wholesome breakfast, minimal cleanup! We enjoy them year-round, whenever we’ve got to rush out the door for school, work, skiing, swimming, travel–with all the healthy things in one tasty shot. We’ve shared other great smoothies here and here, but they haven’t been tested with this make-ahead method. To make-ahead, I usually fill my blender with greek yogurt, a splash of almond milk , organic nut butter, ground flax or oats, cocoa powder and mostly-frozen bananas (using frozen seems to improve the texture of the smoothie). Then whirr, whirr, whirr until it looks just right. After that it’s simply a matter of pouring into freezer containers (these are just right for individual portions) which can then be frozen for later, or enjoyed immediately. My kids’ all-time favorite is the pb-banana-chocolate, though banana-orange-berry and banana-mango-pineapple are tied for second place. No nut butter or cocoa powder in the fruity blends, of course, and blend with juice instead of milk. Now you are officially out of excuses for skipping breakfast. Happy New Year! Did you know I’m a leader in the Udi’s gluten free community? It’s a place for the gluten free people of the world to share ideas for gluten free living. Do you have the exact amount of everything or did I miss it somewhere? Thanks!